BANGI, 12 Nov 2012 – Malaysia has the potential to be a great power in ‘green living’ and ‘green technology’ due to its many success stories in the implementation of green technologies in the energy, water and waste management, building as well as the transportation sectors. Director of the Solar Energy Research Institute (SERI) of The National University of Malaysia (UKM), Prof Dato Dr Kamaruzzaman Sopian said Malaysia also has the potential to be the future regional hub in green economy since the country has the talents and innovative ideas. He described the country’s progress in the green living and green technology field as extraordinary and accelerating at a phenomenal rate. Prof Kamaruzzaman said Malaysia had also introduced the Green Building Index which rates buildings into Platinum, Gold, Silver and Certified categories based on the level of efficiency in the use of resources including energy, water and materials. The ratings also take into account a building’s impact on human health and the environment through its location, design, construction, operation, maintenance and removal. He said “Green Living” and green economy concept adopted has resulted in improved human well-being and social equity while significantly reducing environmental risks and ecological scarcities in the country. He told the UKM News Portal that “Green living” is the applications of clean management concept, clean technology and sustainability policies in order to conserve the natural environment and resources as well as to mitigate the negative impacts of human involvement in various activities. 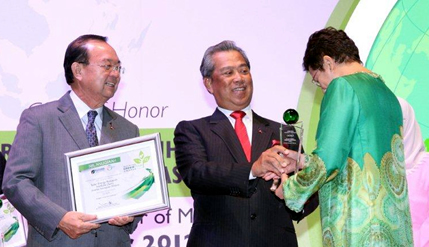 SERI was recently awarded the Gold Medal in the “Malaysia Greentech Awards 2012” in the university category by the Ministry of Energy, Green Technology and Water and the Malaysian Green Technology Corporation. The awards are to recognise efforts and initiatives taken by individuals, companies and organisations that have enhanced or brought about changes that have benefitted the environment as well as contributed effectively towards the successful development of green technology in Malaysia. The awards highlighted the fine example of establishments that emphasize on aspects of renewable energy, research and development, sustainable communications and innovations which are vital in the transformation of the future in green technology. Prof Kamaruzzaman said the gold medal given to SERI highlights the role of the institute in implementing the green community services by using renewable energy technology, especially solar energy, to enhance the economic development of the community in the surrounding areas. SERI was recognised for its the contributions in five case studies in the development of communities, including the establishment of a cottage industry to manufacture solar panels in Terengganu; a solar fish drying operation in rural Cambodia adopted by UNIDO; solar drying of seaweeds in Sabah; solar drying of fish in Pontian and Pico hydro systems in Kg Tuel, Kelantan. Nomination for the Greentech Award 2012 was submitted by SERI for its Green Community Services: Sharing Solar Energy Technology Innovation with Communities in early August 2012. UKM Vice Chancellor, Tan Sri Dato’ Wira Dr Sharifah Hapsah Syed Hasan Shahabudin commended SERI for the award saying the university’s top management have always been extremely supportive of the SERI as it is an important component of the Renewable Energy Niche in UKM. Since its formation in 2005, SERI has secured over RM15million in research funding, 200 publications in journals and proceedings, 30 patents, 4 copyrights and 4 trademarks. It also has over 50 registered PhD candidates and in the recent convocation two PhDs and one MSc was awarded in Renewable Energy, the first of its kind in the region. Prof Kamruzzaman expressed his hope that future products, systems and processes that are not “green” or environment friendly will no longer be in the market with green technology becoming the technology of the future thereby enhancing the environment as well as creating jobs and business opportunities for all.